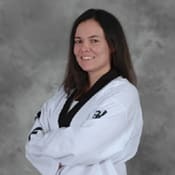 Jane Anderson began training Taekwondo in 2009, and though intensive training, reached her first National title in 2011, repeating the same feat in 2012 (AAU Bronze). Miss Anderson is a certified Taekwondo instructor, and teaches classes for Tiny Tigers, youth and teens. Miss Anderson also helps coach the kids competition team. She continues to train under Master Souza, and remains active competing in the tournament scene. Miss Anderson is a strong believer in the benefits of increased confidence and self-discipline, especially for female students. She is experienced in leadership training, and specializes in helping teens develop confidence, one of the most important factors for success. Fantastic school, everyone is super friendly and involved. Wide variety of classes available. Can't say enough, highly recommend Franklin Martial Arts! I take women's kickboxing and it's one of the best fitness classes I've personally, ever taken. I especially love the instructor's, and my classmate's positive energy. I will definitely enroll in more classes in the future. Having never set foot in a martial arts building, and knowing nothing about any of the arts, I was apprehensive about enrolling in a class. All fears were set aside after the first boxing class. Everyone was so welcoming that by the second class, staff and students alike felt like long-time friends. Loved it so much I enrolled in not just boxing, but also Jiu Jitsu. The staff is highly knowledgeable, personable, accommodating, and fully committed to your success. The facility is clean and well equipped for a variety of classes.